Teaching in Phoenix, in November, is always a treat for a Nebraskan. Teaching at the Seattle Mariners Training Complex makes the experience even sweeter, because of their hospitality. And teaching Cervical Revolution to a group of attendees who ask great questions on how to make sense out of “sense” is even more satisfying. This group worked each other and worked off each other. There was a good mixture of disciplines that all appreciated the need for temporal-occipital and maxillary-sphenoid rotational correspondence. 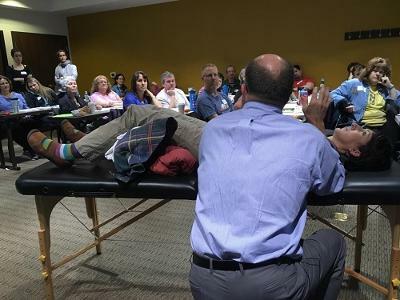 The demonstrations put on by Tiffany Enache DPT and James Wittekind PT, DPT helped everyone better understand the influences that Standing Cervical-Cranial Repositioning and Standing Alternating Reciprocal Cranial Expansion can have on occlusion and sphenoid orientation. I truly enjoyed explaining how a persistent LAIC and RBC patterned individual may be receiving false information from periodontal ligament and teeth that reflect a RTMCC pattern. 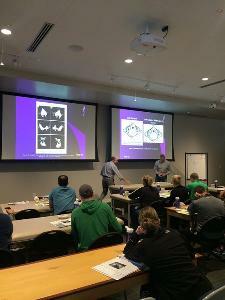 On October 15th I gave a course in Fort Collins, CO at Rebound Sports and Physical Therapy. I especially enjoyed this particular course because of the questions regarding compensation, thanks Tyler Moos; because of the dentists in the room who added so much to the overview of occlusal relationships, thanks Dr. Kim Okamura and Dr. Kingdon Brady; because of the questions regarding treatment decision making and treatment intervention with patients who are in a cervical muscle pattern that relates to cranial position and mal-position, thanks Rob Lynde and Tim Richardt; and because of the host site hospitality, thanks Jon Hartwick and Craig Depperschmidt. I enjoy discussing how occlusion, spinal orientation and cranial osseous position can influence how the neck moves, or does not move. Spinal, cranial bone, tooth to tooth, and atlas on occiput as well as occiput on atlas coupling, can all be disconnected, neurologically and mechanically, if our cranial decompression/compression, inhalation/exhalation, or flexion/extension does not remain rhythmical. The rhythmic flow of information, as complex as it can become, was enforced by the genuine interest of the entire class. This was a fun class to teach because this similar theme of rhythmicity was represented by both the class and the class material. On September 9th and 10th I went to IMPACT Physical Medicine and Aquatic Center in Minneapolis to present Cervical Revolution. It was so good for my heart and soul. In 2004, I met a gentleman named Stan Babel with a multi-disciplinary thinking spirit. Stan has a mind that complimented my mindful behavior. After all, at that time the Institute was only 3 years strong. His demeanor, sincerity and outlook on life reinforced my drive to continue to grow an interdisciplinary culture. The mediocre mind is incapable of understanding the man who refuses to bow blindly to conventional prejudice and chooses instead to express his opinions courageously and honestly. Mr Babel courageously had the first PRI Aquatics pool built in Texas, shipped it to Minneapolis, knocked a hole in the side of a building and created a “stir” of excitement with PRI Aquatic based concepts. I’ve learned so much from him over the years and it all began with genuine honesty and trust. Therefore, giving this course and getting an opportunity to see this pool again was so rewarding for me. The IMPACT staff’s dedication to interdisciplinary mindedness is at the heart of what makes PRI. I asked Jen how many course attendees from IMPACT have attended PRI courses over the years; her response was “definitely over 20” and many of them are certified and have taken multiple courses. Minneapolis/ St Paul was the first real PRI “hub”. We are so indebted to these people. I love them all, I enjoyed teaching material that is related to the neck and that also reflects their work, passion and, yes, their pool. Having Bill Hartman, Mike Robertson and Eric Oetter sit in the first row of any course I instruct is not only an honor, but it's like drinking coffee all day. They change, drive and motivate me to give the best course I can, only because their genuine interest in deepening concepts, therapy philosophies, and neuro-mechanical relationships organized. I always feel welcomed and appreciated. According to Jen Platt they have hosted at least six of our courses and they treat every faculty member and course attendee as one of their “family” members. The diversity of the attendees always reflects the culture of the class and this weekend was so rewarding for me personally because of the questions, interest and diverse reasoning for PRI application. 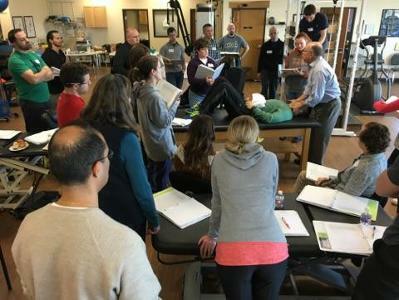 Thank you IFAST, again, for a divergent weekend with course attendees that heard a discussion about a cervical complex that has finite limits. 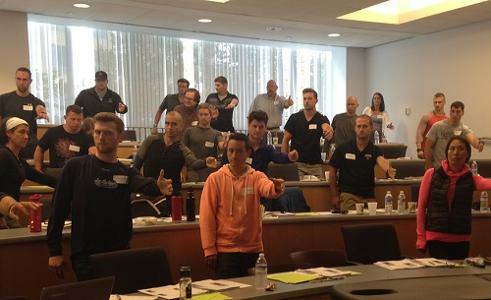 I have the pleasure of teaching Postural Respiration at Finish Line Physical Therapy in New York City on August 13-14. I love NYC for many reasons….but no one is more hospitable than the people at Finish Line. Michael Conlon is the epitome of the word “host”. The material that I presented was the same presentation that I wrote and gave in 1995, before the Postural Restoration Institute was created. It was material based off my study of the cranium, neck and respiration. Its origional1998 PRI course name was Postural Restoration, however I renamed it Postural Respiration in 2004 because of the strong connection of respiratory influence on postural restoration. Not only do I love NYC, but I love teaching this course anywhere, especially when there are “new” PRI course attendees in the classroom. There were 23 “new” course attendees present! Explaining how “over rotation” of a set of ribs can resist movement on a transverse or frontal plane is about as wonderful as hugging my four year old grandson who lives a few blocks down from Finish Line! Thanks for bringing me to NYC…again. Oh, by the way, Dan Cerone, thank you for your feedback after the course. Not only will you “remember it forever” I will remember you as long as I have a memory. Teaching at Northeastern University a course on cervical influences on the body and cranium was so gratifying for so many reasons. It was our 6th course at this host site and after I experienced the warm hospitality and support it probably will not be the last. These people allowed me to get through the course objectives, which many of you know it is difficult because of my love for tangicial speech, and provide historical relationships between osteopathy and PRI concepts. Jen – you have made my job easier because of your hospitality and administrative mission to distribute and receive all pertinent articles and items that the Institute needs. I love teaching this course, but each course has its own personality and the attendees from the Northeast part of the USA, and Israel, the students, the nurse with her CSCS, and the dentist who works with athletes, all now have one thing in common; respect for the temporal rotation and sphenoid greater wing height. Dr. Portnoy thank you for all your contributions and your participation. It helped so much! Boston’s knowledge and application of PRI principles is growing because of the staff at Northeastern University and people like Donna Behr, and Sean Fitzgerald who had assisted and work so hard as PRCs to endorse this Institute! 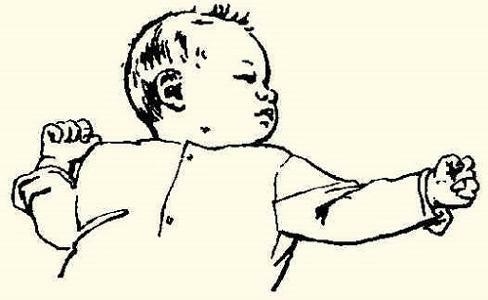 Recent course question: Is the Asymmetrical Tonic Neck Reflex (ATNR) ever fully integrated, or is it constant presence throughout our lives? The ATNR typically is inhibited by the age of 3.5 years. However when a lack of alternating head, trunk and appendage movement occurs, because of visual, auditory or tactile sensory orientation that reinforces homo-lateral movement, the retention of this primitive reflex can have an impact on behavioral formation of the body on rotation indefinitely. Some of the retained symptoms include postural imbalance when the head is turned, difficulty in cross pattern movement of the trunk where one arm needs to move toward the controlled leg, hand-eye coordination difficulty over focus attention of the visual system, visual perception difficulties, cognitive learning challenges, excessive wrist and ankle tone visually on the right side, and bilateral functional integration difficulties in general. The ATNR, like other reflexes that are considered to be associated with vision can be triggered or stimulated reflexively to some degree anytime in life when bilateral or alternating function is challenged by over referencing homo-lateral anti gravitational or positional strategies. 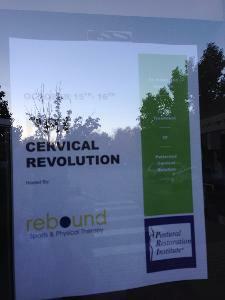 Cervical Revolution. Salem, OR. Course in Review. First Call Home Health knows how to host a course! Mike Cantrell and I really enjoyed presenting the Cervical Revolution course material in their beautiful building and to their staff of both OTs and PTs who have taken many PRI courses in the past. I honestly enjoyed receiving questions from attendees who do so much with the geriatric population and integrating cervical-cranial PRI concepts with all the attendees, and a dentist as they relate to all ages and many different patients and symptoms and diagnoses. I met some great people that I hope to meet again and will not forget how warm of a reception and the rewarding response Mike and I received. This was my first time in Austin and at STAR Physical Therapy. The host site and facilities were exceptional. The clinic is a total reflection of what we do in PRI. It was great having Mike validating terminology, process of examination, treatment, and clinical application. His ability to explain this course’s application will be very helpful for any course attendee who takes this course. The course also gave me the personal opportunity to learn what was meaningful to experienced PRI PTs, strength coaches, and ATCs. I want to have a special shout out to Eric Broberg, DDS who stuck with me both days to give input on the material as it relates to cervical orientation. This weekend of validation and confirmation was hopefully realized by all attendees to help realize when to use dentistry in the treatment of patients with neck dysfunction.